River Haven MARK III Black Rubber Archery Blunt Sales! 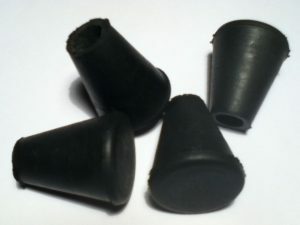 Order your River Haven MARK III Black Rubber Blunt Arrow tips here! As required in the Lochac Combat Handbook – Missile Weapons Standards 10.3. Made by Allied Rubber Technologies (Brisbane) for a custom production run using a patent natural rubber mixture. Average weight of blunt is 6 grams. With a diameter of 20mm, and 26mm in length to fit a 8mm shaft, this arrow blunt is the fear of many heavy combatants throughout the Lochac Kingdom! Postal delivery can be arranged for anywhere in Australia and New Zealand to SCA members! Price: $2 each (therefore $12 a half dozen, and $24 a dozen), plus postage. Combat arrows and public archery practice arrows must not have points on them. The points must be removed or not attached in the first place. Instead, a so called “archery blunt” must be attached to the combat arrow. 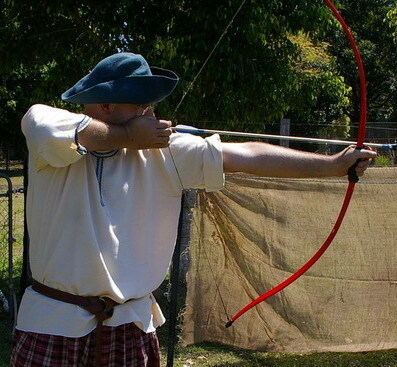 Archery blunts are a special product developed in the SCA specifically for combat use. A substitution with other types of blunts is not allowed. Blunt are available for sale within the SCA here! Overheard statement by a Heavy combatant at GNW 2011. Shafts must have a diameter of 8 mm or 5/16 inch. Blunts must be secured using a strip of good quality 13mm-wide electrical or fibre tape wound down around the sides of the blunt for at least 13mm, and then up onto the shaft of the arrow for 25mm. slot to where the blunt joins the shaft. Shafts must be made from one of the following woods: Port Orford Cedar, Silver Ash, or Tasmanian Oak. be in good condition without any sign of the fibres lifting from the shaft. Blunts must be firmly secured to the shaft so that they cannot come off on impact or if the shaft is broken. To allow inspection of possible punch-through the face of the blunt must not be covered.